If writing to an existing Geodatabase this may be a problem because the table names don't match up. 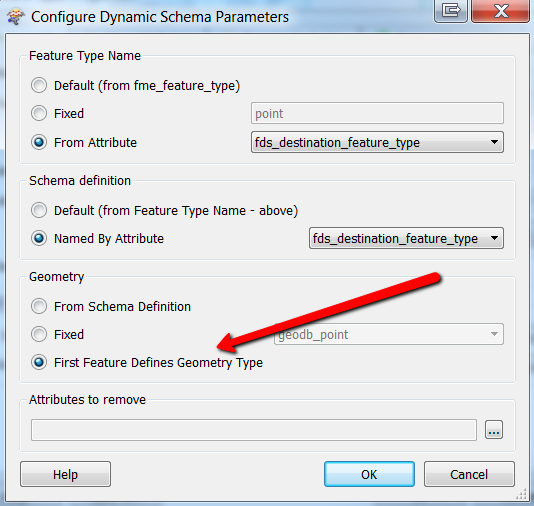 The solution to the problem is to set the Geometry under the Dynamic schema parameters dialog to "First Feature Defines Geometry Type". Thus the first feature to hit the writer will be used to define the geometry of the feature type and the feature type will not be appended with the geometry type suffix. If writing to existing feature types the names will now match and the correct feature types will be updated/deleted. *Note: If any other geometry follows, it will be written to a feature type which *does* include the "_geometry_type" suffix.